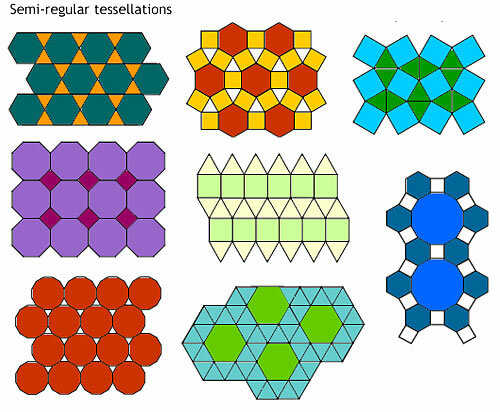 fun stuff > what is a tessellation? A tessellation is a regular pattern made up of flat shapes repeated and joined together without any gaps or overlaps. These shapes do not all need to be the same, but the pattern should repeat. Another word for tessellation is tiling. The word tessellation is derived from the Greek "tesseres", which means "four" and refers to the four sides of a square, the first shape to be tiled. A regular tessellation is a pattern made by repeating a regular polygon. A regular polygon is one having all its sides equal and all it's interior angles equal. So there are only 3 kinds of regular tessellations - ones made from squares, equilateral triangles and hexagons. Where the shapes join together, the corner point, we call that the vertex. By looking at the vertex and counting the sides of all the shapes that meet at the vertex you are able to name a tessellation. Choose a vertex and count the sides of the polygons that touch it. 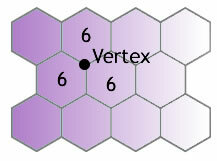 In the example above of a regular tessellation of hexagons, next to the vertex are three polygons and each has six sides, so this tessellation is called "6.6.6". A semi-regular tessellation is made of two or more regular polygons e.g the hexagon and diamond shape above. The pattern at each vertex should be the same. 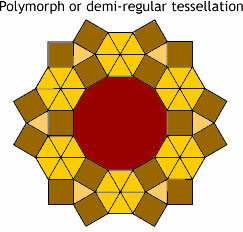 There are also demi-regular tessellations or polymorph tessellations, but they are difficult to define. Some have described them as a tilings of the 3 regular and 8 semi-regular tessellations, but this is not a very precise definition. Others have tried for more specific or complicated definitions. If you're interested in finding out more you can read a description of polymorph tessellations here. And some people allow for tessellations of curved shapes. 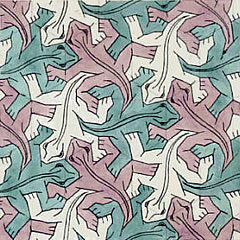 The above exampe of the tessellated lizards was done by famous artist MC Escher.